Start a lottery syndicate for free! 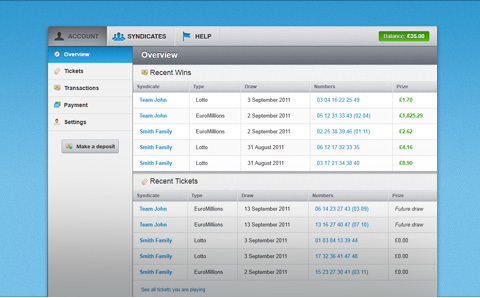 Syndicate Tool helps you manage tickets, members and payments for your syndicate. Get a real syndicate agreement in 2 minutes! Collect money, buy tickets and track prizes automatically. Get your syndicate on Syndicate Tool. Add your members and tickets. View your new syndicate agreement. Syndicate Tool helps you collect money, buy tickets and win more prizes! Start as many syndicates as you like and play with friends, family and colleagues. Anyone can be a syndicate manager! Never have a dispute over tickets or winnings. Syndicate Tool keeps a contract with detailed records for every ticket played. Ticket copies are stored safely in your account and members are notified of wins. No more making photocopies or spreadsheets. Syndicate Tool collects money, buys tickets, checks results and divides prizes automatically using a complete accounting package. Create beautiful reports and charts for your members. Get a quick overview and keep detailed track of your progress. Syndicate Tool is hosted alongside Google's infrastructure and uses high-grade encryption for all sensitive data. won by Bow Boys on the Lotto, 1 day ago. won by Check Mates on the Lotto, 1 day ago. won by Class Act on the Lotto, 1 day ago. won by Desperate Measures on the Thunderball, 2 days ago. My members are much more well-informed, now that every ticket is visible in my account. We also feel much safer knowing that there is an accountable syndicate agreement in place. We used to keep syndicate records in five different spreadsheets. I'm very happy that my Wednesdays are no longer spent chasing payments and photocopying tickets. I have a lot of confidence in Syndicate Tool. The software is easy to use, it does exactly what it says on the tin and I know that I will never forget to play. Why should I use Syndicate Tool? How much does Syndicate Tool cost? Do we need a syndicate agreement? Do I have to book or arrange to buy tickets every week? How does Syndicate Tool buy National Lottery tickets? What happens if my syndicate wins a prize? How are you related to the National Lottery?